Join us at Local Roots where you’ll have access to locally sourced food, microbrew and conversation with the “who’s who” of urban farming in LA. Featuring food from Bohemia food truck and a local LA brewery. Urban farms are potentially the next big thing in ag, and LA’s sprawl is fertile ground. Three innovators in indoor ag, plus a who’s-who open mic of local experts bring us up to date on LA’s urban farming scene, and forecast opportunities for the region. Entrepreneurs and DIY-ers discuss their experience with and the opportunity for indoor farm boxes with precision climate control systems, sustainable indoor and outdoor urban farms, social justice and food security for underserved communities, engaging under-utilized urban sites to produce high-quality local food. Larta is organizing this event in partnership with: Local Roots, Indoor Ag-Con, and Sidley Austin LLP. How to meet the need of growing urban populations like the greater Los Angeles metropolitan area for fresh produce is a timely topic that is the focus of an urban farming networking event that Larta is organizing as part of Innovate LA 2016. Urban farming includes indoor and outdoor innovations. 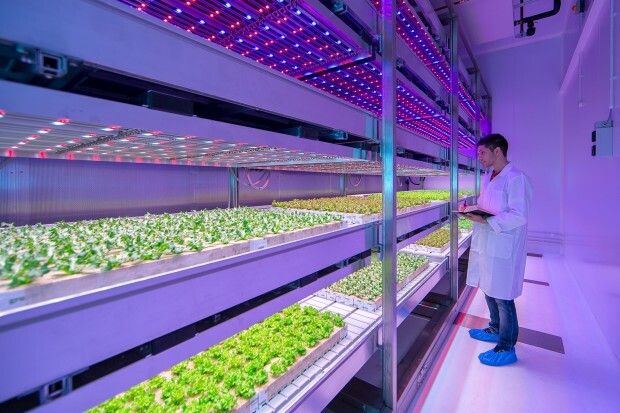 Indoor agriculture includes both urban and rural operations. The October 20th Global Ag Innovation Network (GAIN) event will feature a panel discussion on indoor agriculture, and urban farming representatives will step up to the microphone for short spotlights at the evening event, hosted by Local Roots in Vernon. As one of our event partners, Autogrow, reported at Ag Showcase in September of 2016 Indoor Ag has arrived. One of our other partners, Local Roots was featured in the May issue of LA Weekly in an article entitled Could the Future of Urban Agriculture Be Located Inside a Vernon Warehouse? Our panelists include an investor and two entrepreneurs known for their passion and expertise regarding indoor agriculture: Nicola Kerslake, founder of Indoor Ag-Con and Newbean Capital, Eric Ellestad, CEO of Local Roots, and Kelly Nicholson, North American Sales Lead for Autogrow. 2015 © Ag Innovation Showcase. All rights reserved. Produced by Larta Institute.